Garuda Indonesia is on a digital transformation journey to optimize and mobilize its workforce in a secure way. In working towards an “electronic flight bag”(1) to replace aircraft manuals in the cockpit, the airline used IBM® MaaS360® solutions to easily distribute, update and track mobile devices, apps and content, and address regulatory requirements. Garuda Indonesia needed to enable and mobilize its workforce securely. 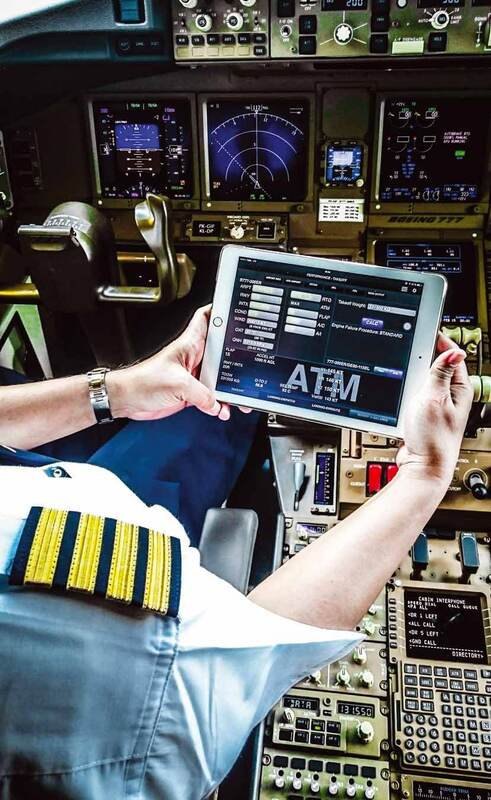 In working towards an “electronic flight bag” for pilots, it sought a comprehensive enterprise mobility management solution. Using IBM® MaaS360®, Garuda Indonesia can manage all its Aircraft iPad, apps and content securely and centrally anytime and anywhere, and safeguard content in the event of loss or theft. Traditionally, aircraft manuals were printed and distributed in paper form. Pilots would carry with them piles of manuals—often weighing more than 30 kilograms (66 pounds)—in a small black rolling suitcase from one flight to another. For each flight, they would have to search through the documentation for the information they needed to perform required checks and calculate key performance metrics. Sulistyo Nugroho, Operation Publication Control Coordinator at Garuda Indonesia, and his team began exploring ways to create a mobile device solution for the airline’s pilots by implementing an electronic Performance Calculation app and electronic Viewer for A330 and B777 aircrafts. The mobile device solution utilizes iPad tablets, and it is a further step to electronic flight bag. The electronic flight bag is an important solution for the airline industry, helping airlines worldwide eliminate paper in the cockpit. The mobile device solution provides all the data and apps the pilots need to help flight crews perform flight management tasks, such as completing flight performance and loads calculations, more easily and efficiently. It also makes it easier for airlines to confirm pilots have the latest manuals and information, and to distribute updates when needed. Garuda Indonesia implemented an electronic Performance Calculation app and electronic Viewer for Airbus A330 and Boeing 777 aircrafts. Garuda Indonesia pilots can use “iPad in the Aircraft” to access Airbus and Boeing apps, and view electronic documents, such as PDF and OLB files, related to the Aircraft Document Onboard required. They can also conduct required performance calculations, drawing on content from the electronic documents and a performance database. For Garuda Indonesia, the implementation of an enterprise mobility management solution was required to achieve its larger goal — moving toward a paperless cockpit with the future electronic flight bag. “Our company will not run any solution prematurely,” says Nugroho. “We could not implement our electronic flight bag before finding the right solution and gaining approval from regulatory organizations. IBM MaaS360 provides a reliable and sophisticated way to manage mobile devices and content.” Since implementation of its electronic Performance Calculation app and electronic Viewer for A330 and B777 aircrafts, the company has realized significant productivity savings over previous processes. “Productivity increased by nearly 50 percent for our pilots and 30 percent for Operations staff,” says Nugroho. “Pilots can find the information and perform calculations in 5 minutes that before might take 10-50 minutes.” Today, the airline’s mobile tablets serve as standalone devices, not mounted in the cockpit, and they must be stowed by the pilots during takeoff and landing. However, the airline is working to expand capabilities and planning to provide new apps and capabilities for use during all flight phases. With MaaS360 solutions, Garuda Indonesia can easily scale mobile management to support more devices, content and apps. “IBM offered an agile solution that not only met our immediate needs, but could also accommodate growth of our mobile solution, such as advanced tracking capabilities and the scalability to conduct timely queries on larger amounts of data,” says Nugroho. (1) Garuda Indonesia’s first implementation towards an electronic flight bag was an electronic Performance Calculation app for A330 and B777-300 pilots. Garuda Indonesia, the national airline of Indonesia, serves over 40 domestic and 36 international destinations. It has been named as one of the world’s best regional airlines by Skytrax. The airline carries more than 25 million passengers annually. © Copyright IBM Corporation 2016. IBM Security, Route 100, Somers, NY 10589. Produced in the United States of America, August 2016. IBM, the IBM logo, ibm.com, and MaaS360 are trademarks of International Business Machines Corp., registered in many jurisdictions worldwide. Other product and service names might be trademarks of IBM or other companies. A current list of IBM trademarks is available on the web at “Copyright and trademark information” at ibm.com/legal/copytrade.shtml. This document is current as of the initial date of publication and may be changed by IBM at any time. Not all offerings are available in every country in which IBM operates. The performance data and client examples cited are presented for illustrative purposes only. Actual performance results may vary depending on specific configurations and operating conditions. It is the user’s responsibility to evaluate and verify the operation of any other products or programs with IBM products and programs. THE INFORMATION IN THIS DOCUMENT IS PROVIDED “AS IS” WITHOUT ANY WARRANTY, EXPRESS OR IMPLIED, INCLUDING WITHOUT ANY WARRANTIES OF MERCHANTABILITY, FITNESS FOR A PARTICULAR PURPOSE AND ANY WARRANTY OR CONDITION OF NON-INFRINGEMENT. IBM products are warranted according to the terms and conditions of the agreements under which they are provided. The client is responsible for ensuring compliance with laws and regulations applicable to it. IBM does not provide legal advice or represent or warrant that its services or products will ensure that the client is in compliance with any law or regulation. Statement of Good Security Practices: IT system security involves protecting systems and information through prevention, detection and response to improper access from within and outside your enterprise. Improper access can result in information being altered, destroyed, misappropriated or misused or can result in damage to or misuse of your systems, including for use in attacks on others. No IT system or product should be considered completely secure and no single product, service or security measure can be completely effective in preventing improper use or access. IBM systems, products and services are designed to be part of a lawful, comprehensive security approach, which will necessarily involve additional operational procedures, and may require other systems, products or services to be most effective. IBM DOES NOT WARRANT THAT ANY SYSTEMS, PRODUCTS OR SERVICES ARE IMMUNE FROM, OR WILL MAKE YOUR ENTERPRISE IMMUNE FROM, THE MALICIOUS OR ILLEGAL CONDUCT OF ANY PARTY.